Do you eat 5-9 servings of fruit and vegetables every day? I know I don’t. I’m trying to do better but it’s a work in progress. In the meantime I tried Tropical Traditions Antioxidant Omega 3 Greens. If you have never tried a thick green drink, it might seem a little strange. I’ve tried several and never ended up finishing a can. I like the idea of all the nutrients and vitamins but I have never liked the taste. I can honestly say that I liked this drink. I will drink this every day and will buy more! It’s that good. I tried the mint flavor and loved it. I really like mint but they also have a berry flavor for those who might want something different. The mint is a light flavor that doesn’t over power you and is strong enough to leave a slight minty aftertaste which is great. Why Antioxidant Omega 3 Greens? Antioxidant Omega 3 Greens contains a variety of high ORAC value whole foods, providing you with optimal levels of antioxidants that would be difficult to get on your own. Antioxidant Omega 3 Greens also contains 2600mg of Organic Flax & Organic Flax Lignans per serving, rich in ALA Omega 3 fatty acids. Please note: Elderly persons or those suffering from cardiovascular disease, liver or kidney problems or potassium deficiency should consult their health care professional before consuming licorice root. We also offer this product without licorice root extract. 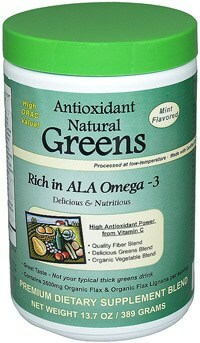 On sale this week, Antioxidant Omega Greens 3 is half off until July 18th. It’s $22 instead of $44. Tropical Traditions will give you a free Virgin Coconut Oil book with your first purchase from their website. When you go to their site and enter this code (4009522) in the Referred by a Friend box you will have the free book added to your order. Remember when you place an order it will ask you “How did you hear about us?” That’s where you choose the referred by a friend box that will allow you to put the code in. Tropical Traditions has a very helpful Customer Service department. If you need help with your order you can send them an email and they will help you out. If you need help in how to get your free book they can help you with that also. I was given a bottle of Antioxidant Omega Greens 3 for review purposes. I was not financially compensated for this review and this is my honest opinion. Thanks for the giveaway…subscribed to the Tropical Traditions newsletter. … already subscribed to the mailing list of Simply Stacie. subscribe to the Tropical Traditions email sales newsletter.